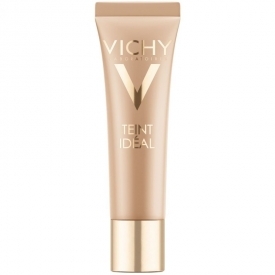 This new Vichy liquid foundation product comes in a glass bottle with a pump for normal/combination skin and in a tube for dry skin. I had an opportunity to test this one for dry skin in a 25 Moyen Sand shade. First of all the texture of the product is absolutely nice. It's so airy, mild and fluffy and it's a kind of pleasure to distribute it over the skin. While on the skin the cream also makes it feel very comfortable and relaxed. It doesn't block pores at all, the wear is so light and the skin can breathe. It is like under some fluffy blanket which warms and protects it. The shade of the fondaion merges with your own skin tone very well. It's buildable and works well to cover minor flaws and even skin tone without using concealer and even powder as it gives a matte finish itself. No mask effect or something that you can be afraid of. The only thing I noticed that the product emphasizes dry patches on my skin so it can't be very much suitable for dry skin (despite being formulated fot it). Another remarkable feauture of the product is the light-reflecting pigments which really brighen and illuminate the skin. Regarding this feature some may like it and others dislike. As to me I can't say I liked it much. Maybe it erases flaws visually but if you don't have much of them this cream can give an effect of too whitened and unnatural skin tone. Standing at a distance from the mirror I could see my face as a luminous spot without defined outlines. It's way unusual but I think it can do a good job to those who are searching for these particular features.To summarize all the above I can recommend this foundation which combines radiant, even skin with comprehensive care and protection.